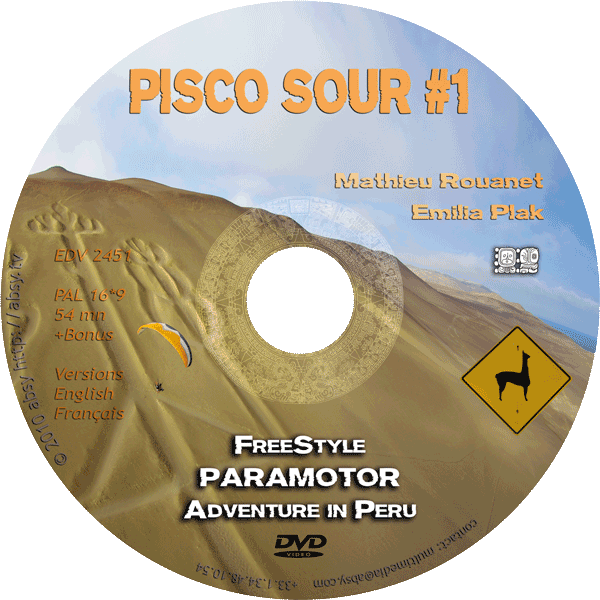 DVD - Pisco Sour #1: Freestyle Paramotor Adventure in Peru! Freestyle PPG in Peru DVD with Emilia Plak and Mathieu Rouanet. Ex-world champion Mathieu Rouanet and Emilia Plak, two of paramotoring's most well-known personalities meets in Peru for a three months adventure. They share with us the freedom, discovery and exploration flights of exceptional and authentic sites. Flying with pelicans, Nazca lines, Grand Canyon of Colca and its condors, and the ancient city of Cusco, the centre of the Inca world. A road and flight trip that will impregnate us with Peruvian culture and the country's welcoming and beautiful landscapes. During a 3-months trip to Peru, the famous couple of top paramotor pilots had the chance to fly and discover some of the most stunning landscapes of the region, including the Nazca Lines, the Grand Canyon of Colca and its condors, and the ancient city of Cusco, the centre of the Inca world. Watch the trailer of the movie below, just released. Named after a popular Peruvian/Chilean cocktail, the film ‘Pisco Sour’ will bring some of the local culture and the country's welcoming and beautiful landscapes to our eyes, together with good freestyle paramotor flying. ‘Pisco Sour’ will be competing at El Yelmo film festival in July 8-10, in Spain, so if you are going there you’ll have the chance to watch it on a big screen. Please note that the format is PAL - it will work on your computer, but it will not work on most DVD players.